22 registered (RStringer, bcraley, Mike Whatley, Zep, SetterGuy, gehajake, teehjaeh57, Vortex 4, FireIsHot, roundy, canyoncreek, gregory, Jimmi, Dave_IA, Bocomo, wannapond0001, Bill Cody, ryjohn, Tbar, Criegg, rjackson, John Fitzgerald), 195 Guests and 160 Spiders online. A couple of CNBG from May and June. Some interesting color variations in these fish. I failed to mention that these two fish came from different ponds. 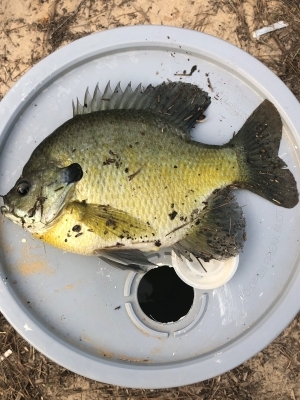 This probably explains the color variations as lighter colored fish came from the smaller pond that stays muddy and the darker fish came from the pond that is much more clear. Have you use phone camera for this?Looks nice.